Renmore Gymnastics Club has won the national championship title for the first time in the club's history. In doing so the local gymnasts broke the 15-year reign of Salto Gymnastics Club, and they did it in style - finishing 10 marks ahead of runners-up Nadia Gymnastics Club. 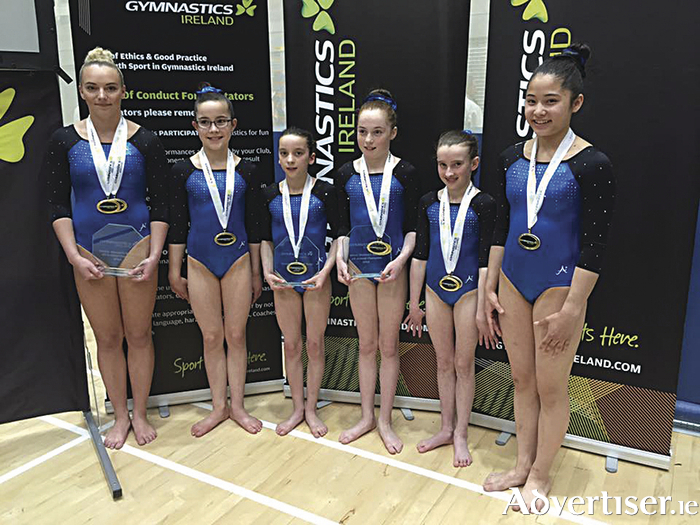 The Galway gymnasts, Kate Molloy, Jane Heffernan, Emma Slevin, Miriam Fuller and Emer Shimizu, were joined by Olympian Ellis O'Reilly, who won the senior title. Slevin took the minor title, followed by teammate Jane Heffernan in second, while Kate Molloy was fourth. With a total of 22 clean routines, the Galway girls headed off all challengers - even without the inclusion of O'Reilly's impressive scores. On the second day Renmore again dominated the podium with gold, silver and bronze in all the apparatus finals. The squad then followed up the achievement with a silver medal as Team Ireland in the Isle of Man.